Xiaomi has started rolling out MIUI 10.2.6.0 Global Stable ROM for Redmi 6 device. The new MIUI 10 brings improved performance, new notification style, new recent menu, Image search, smart assistant and more. The Android 8.1 Oreo-based OTA update is rolling out to the Redmi 6 device in batches. So, it will take some time to receive globally. 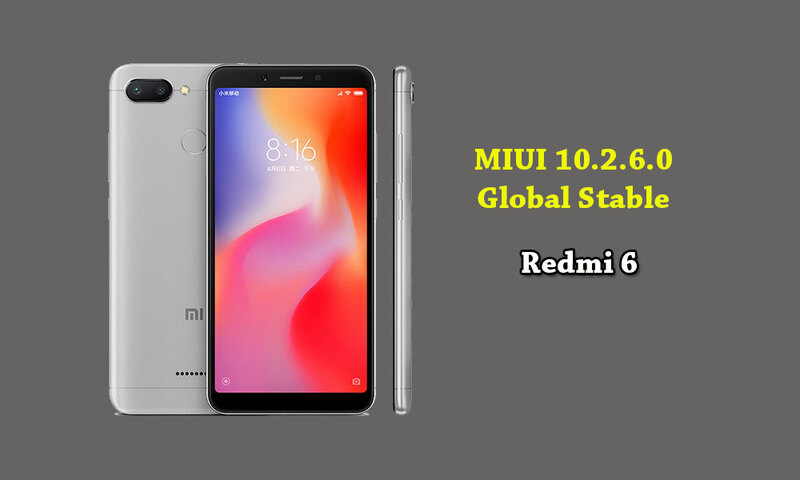 However, you can download and install MIUI 10.2.6.0 Global Stable ROM on Redmi 6 manually. The new update build number is MIUI 10.2.6.0 OCGMIXM for Global Version is rolling out via OTA update. It brings so many system improvements and bug fixes. Once the OTA will be available for your IMEI series, users will receive the notification pop up for download and install. You can manually check for the update from the device Settings > About Phone > System update > Check for update. You can also Download the MIUI 10.2.6.0 Global Stable ROM on Redmi 6 handset. Tip: Take a complete backup of your device before doing anything. The Firmware files are only for the Xiaomi Redmi 6. Don’t try this ROM on any other device. thedroidguru won’t be responsible for any damage to your phone. Do it at your own risk. It’s highly recommended to take a complete backup of your phone easily. Make sure that your phone has at least 50%-60% charged for a smoother process. You can check the guide given below to install the MIUI 10 ROM (Global + China) on Any Xiaomi device properly. Important: Make sure that for this recovery ROM, you only need to follow Method 1 (Recovery ROM). Download the Recovery ROM file from the above link. Save the downloaded firmware file into the downloaded_rom folder of your internal storage of Redmi 6. Open the Updater app directly or go from the System Update (three dots menu from upper right corner). Tap on the menu icon, the three dots at the top right corner and select Choose Update Package. Select the downloaded ROM file from the internal storage. Now proceed to update and wait for the complete installation process. Your device will Reboot into the new system. Enable USB Debugging and OEM Unlock on your device via Developer Options. Download the latest Mi Flash Tool and install it on your PC/Laptop. Switch off your device and boot into fastboot mode (Press and hold the Power button + Volume Down button simultaneously). Now connect your device to PC via USB cable. Extract the Fastboot ROM file into a folder path on your PC. Open the Mi Flash Tool on your PC. Then copy the extracted file path and paste in on the address bar of Mi flash tool. Click on the refresh button to recognize your device automatically (Fastboot device). If the Fastboot device added, you will see a device id listed. Now click on the flash button to start the flashing process. Your device will reboot automatically when the flashing process is completed. Wait for the few minutes to boot completely into the new system. Hope you are clear with the guide. If you have any queries or feedback please comment below.